Tempura, or crisply fried battered seafood and vegetables, may seem quintessentially Japanese, but tempura is actually an import from Portugal. Portuguese missionaries and merchants who came to Japan in the 16th century brought with them guns, Christianity, and frying, mostly fish which they ate on Fridays. One theory states that the Japanese equated fish frying with Catholicism, calling frying templo, Portuguese for church. Another theory is that tempura came from tempora, or lent (source: A Taste of Japan by Donald Richie). 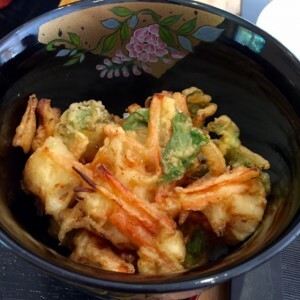 Three important things about tempura that make it scrumptiously light—it must be deep fried at high temperature (180 degrees C) and in lots of oil, so fry in a roomy wok, not a shallow frying pan. Thirdly, a very light batter is key, made just before frying. Do not beat, but just use chopsticks to stir lightly, half a dozen times at most; the batter should be lumpy and watery thin, not thick. To make batter, use about one cup (250mL cup) of tempura flour and about 200mL icy cold water. You can also use plain flour with about 10 per cent cornflour or potato starch with one egg yolk and cold water, but make sure you make the batter just before frying, preferably while the oil is heating, otherwise the gluten strands will begin to form and you will end up with a thick, gluggy batter. Heat lots of oil (Sunflower Oil, Grapeseed Oil or any quality vegetable oil, but not oils with flavour like olive oil or Peanut Oil) until 180 degrees. To check if oil is hot enough drop a tiny bit of batter into the oil and if it rises to the top immediately, it’s ready. If the batter lingers at the bottom, the oil is only 160 degrees or lower. Cook vegetables first—asparagus, sweet potato, carrot, zucchini, etc. and then prawn, then finally fish. Drain the oil well, and always serve hot, with a tempura dipping sauce, grated white radish and ginger. Alternatively, you can serve with lemon/lime/yuzu, a little salt or green tea salt is nice. The secret to great tempura is in the mess you generate. When your battered ingredient hits the oil, lots of tenkasu or little sprays of batter should result on the surface of the oil. This means the oil and the batter is just right. If your tenkasu (literally tempura rubbish) is not copious and does not spray out like fireworks, then something’s not right. Scoop the tenkasu frequently with a net and keep it for putting in soups, soba, udon, and into okonomiyaki. Keeps a few days in the fridge and is yummy. 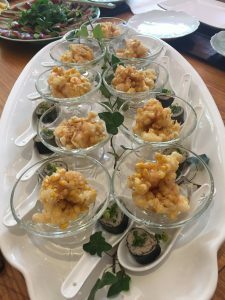 Insider Tips: Here are two Japanese chef tips–1. to make straight tempura prawn, make 3-4 shallow incisions on the belly side of the prawn, or push the belly side in 3-4 places to “break the back” of the prawn so it lies flat. This way, it will cook straight instead of turning into Sydney Harbour Bridge. 2. Clip the tip of the prawn tail-the upper tip that sticks up from the butterfly-like tail. Water is contained in this part of tail, and will give you grief when frying. Here’s our friend and innovative chef Chase Kojima of Sokyo in Sydney on Food Safari Earth, talking about his version of tempura. We love Chase.